Good display and good account Jukka. Yes, the mental stage is always the same. But it sounds you had time to enjoy the sight. I am envious. 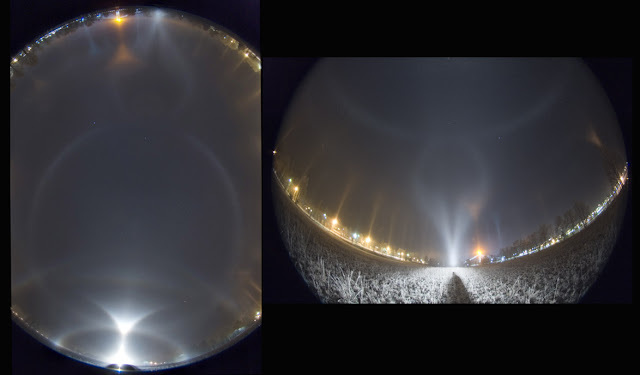 Wow Marko I like to see that same display with an elevation of 22 degrees so you can see the parhelic circle and the 120d parhelia arcs. Keep up the good work on them divergent light source halos, its nice there is more attention being focused on them. It is so exciting to see what a cornucopia this new lamp has opened up. Jukka, you shouldn't underestimate your display, either. It is a very pretty one and I enjoyed reading your account. I'm wishing you for this winter many diamond-dusty days Riihimäki.